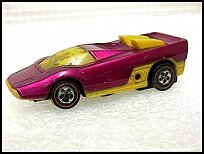 The Sizzlers were a series of very cool looking Hotwheels cars made by Mattel starting in 1969. These toys had a rechargeable battery contained within a cool and often colorful plastic body. These cars would run quite a few times around an oval track on a single charge. Many car designs mixed with many body colors lead to a plethora of different cars to collect. It is quite amazing to me how few people even remember this series of toys. Unlike their non-electrical counterparts the Sizzlers seems to have vanished off the face of the earth without leaving a trace! Perhaps it was because they were constructed of lightweight plastic instead of metal like their counterparts. I still have two cars in running condition today, although most of the batteries in my other cars have long since rotted away. I recently found a chrome plated modifies van Sizzler at the local flea market in with a bunch of hot wheels but this was the only one I have seen in several years of looking. Many of the early cars (especially those bundled with sets) seem to have been produced in a all chrome style. My Mustang and Van are both chrome. You can find pictures of these cars at Virtual Vikkis Treehouse. There were many innovations during the run of this series of toys and new features were constantly being added. One of the accessories that I remember most clearly was the "Moustache" which was a flat forked black plastic thing with very rounded edges. Evidently children had been using the cars in their kitchens without a track and ended up denting both the molding and the cars. The "Moustache" was very flexible and bounced the car off in another direction. The cars would literally race around the room without stopping at all. In the later years Mattel added "Motorev Engine Sound" to all the cars in the series. This made the cars make a car like grinding sound. There were three different ways to recharge the Sizzlers. The first was the GoosePump which contained two D sized batteries in a red container with a small jack which you would plug into the side of the car. I am not certain but I seem to have a great number of these when I was young. They probably were bundled with the race tracks. The second, and slightly more fancy mechanism was the Aptly named Juice Machine which looked like a gigantic gas pump. This mechanism held many more batteries. The third and much more expensive way was the deluxe Power Pit. The power pit was designed to look like a miniature gas station where your cars could pull off and recharge. This unit plugged into a wall outlet and features a automatic timer mechanism to ensure proper recharging of you cars. A knob on the top when twisted activated a mechanical timer. The original tracks were the traditional Hotwheels type orange tracks put together with those maroon tongue depressor things. Later on they introduced what was known as a "fat Track" which had track about 4 inches wide and high banked corners. This track was far superior as it allowed you to actually race your cars and allowed for passing to occur. I have no idea how I forgot to mention the Earthshakers. These were motorized construction vehicles. They moved very slowly unlike the rest of the toys. They also made a earth shaking sound. I there there were four different machines. I alos seem to recall they were also sold in a cool set with a charager and some other construction things like barricades and fake rocks. As the years went by new lines were added including The "Hotline" series of trains. There was a basic set which made a square track. Options included a series of mechanisms to load and unload the freight cars. The basic train came with an engine (similar in design to the Tycho Turbo Train) a fright car, a coal type car (with side dumping action) and a caboose passenger car. There was also a series of Sizzler motorcycles produced and a series of construction equipment called "Rummblers". On a similar line (but not part of the sizzler series) were the HotBirds. These were more traditional metal machines, but rather than being cars these were of planes! These planes could fly... well sort of.. Actually they could slide along a piece of fishing line via a paper clip like device which would be inserted into the top of each plane. They even had a gadget which had a built in fishing line and clamp that you could take with you and easily attach to any nearby object. More often than not the planes would not make it all the way down the string and they would get tangled up in the middle, but they were truly cool to look at and dream about flying. As far as I know only one of the Hotbirds was a prop driven plane. There is also a great full color book put out about Sizzlers including pics of all the cars and many of the sets. I'll have a picture and an address to write to at Virtual Vikkis Treehouse as soon as I can get my act together!